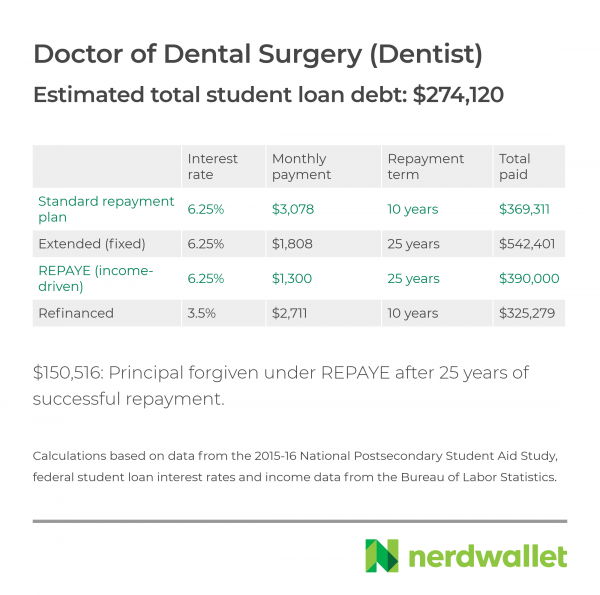 MBAs, lawyers, dentists and doctors have repayment options that could save them thousands, according to NerdWallet's examination of four repayment options for federal loans. Recently, the nation’s student debt hit a new high, reaching $1.5 trillion. And while the average debt load is about $31,000 among the 45.2 million Americans with such a burden, according to the National Center for Education Statistics, about 2.5 million Americans are indebted $100,000 or more. Advanced degrees, such as those required for legal and medical professions, come at a premium. But if these graduates, with debt that soars above the national average, carefully consider their repayment options, they could save hundreds of dollars each month and up to hundreds of thousands of dollars over the life of their loans. Paying down student loan debt can take decades. There are several repayment options available to those with high debt, but it’s difficult to know which is best for a borrower’s unique circumstances. The standard 10-year repayment plan that most borrowers start out in. A fixed-rate 25-year extended plan. The Revised Pay as You Earn (REPAYE) income-driven plan that offers balance forgiveness after 25 years of payments capped at 10% of discretionary income. Refinancing student loan debt under a lower interest rate upon graduation, an option available to those with good credit scores and adequate income. For details and requirements for each of these repayment options, click here. »CALCULATOR: Should you refinance your student loans? The median student loan debt of 2016 MBA graduates was $55,800, according to the NCES. These graduates are unique in that the median MBA student loan debt is low relative to the high average income. So, an income-driven plan like REPAYE would carry the highest monthly payments, but pay off the debt in the least amount of time. On the other hand, a graduate able to refinance upon graduation — with a high credit score and low debt-to-income ratio — would balance tolerable payments with a reasonable repayment term and potentially save $5,300 over the standard 10-year repayment plan. Future attorneys, graduating with a Juris Doctor in 2016, left school with a median debt of $133,500, according to the NCES. Assuming they average an annual salary of $141,900 for the first few decades of their career, they would pay off their loans under REPAYE before being able to reap the benefit of forgiveness. Also, the income-driven repayment plan would leave them paying about $38,700 more over the life of the loan when compared with the standard 10-year repayment plan. Refinancing their loans upon graduation, however, would save $19,500 when compared with standard repayment. Dentists graduate with the highest student loan debt load of all professions analyzed — $274,100 in 2016, according to the NCES. It’s because of this high balance and relatively midrange salary that they stand to get the most out of student loan forgiveness under REPAYE in our analysis. After 25 years of $1,300 monthly payments, they would be eligible to have the remaining $150,500 principal forgiven. Still, those carrying this amount of debt would pay less over the life of the loan by sticking with the standard 10-year plan or refinancing at a lower rate. If the higher monthly payment of those options is manageable, the borrower could save $20,700 or $64,700, respectively. 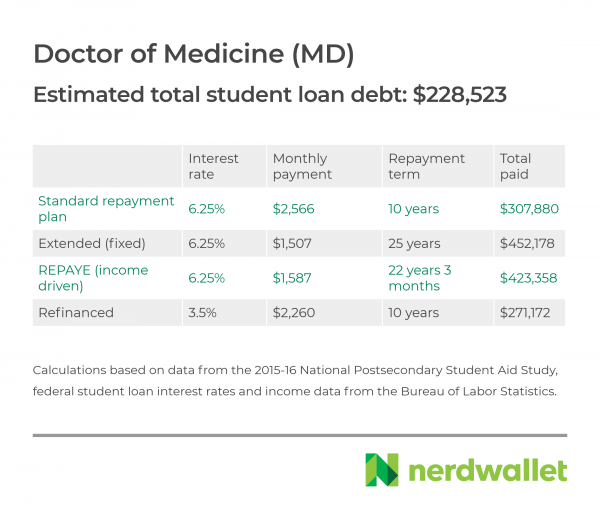 Future doctors, leaving medical school with a Doctor of Medicine degree, also left with median student loan debt of $228,500, according to the NCES. This group may see the lowest monthly payments by entering an extended repayment plan, but stretching those smaller payments out 25 years would deliver the largest total amount paid — $452,200 over the life of the loan. Entering into the REPAYE plan would keep high payments at bay, but would still cost $115,500 more than the standard repayment plan when all is said and done, and given the average salary for general practitioners, the loan would be paid off before our doctor could take advantage of any forgiveness. For those not in public service or nonprofit jobs, the solution may lie in combining approaches — entering an income-driven plan like REPAYE for the first several years, then refinancing once their income grows and allows bigger monthly payments, for example. Lenders also offer shorter terms under refinancing that could let high-income borrowers pay off their debt even quicker than the standard 10-year repayment period. Borrowers should use a refinance calculator to see how much they can save with a lower interest rate. A discretionary income calculator shows payments under income-driven repayment plans. 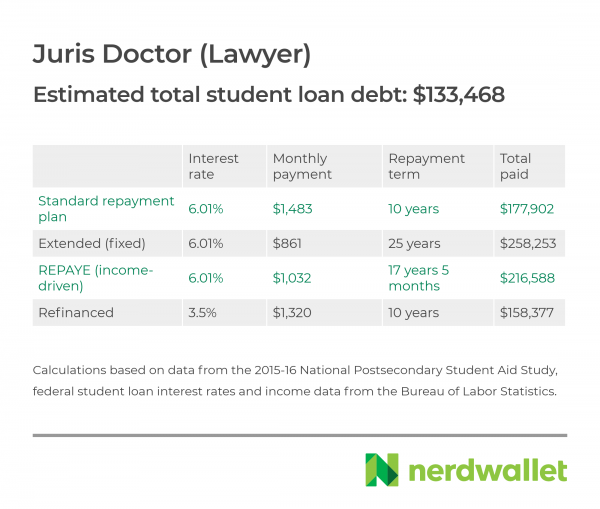 Median debt levels represent cumulative amount owed on all loans by degree program and were obtained from the National Center for Education Statistics’ 2015-16 National Postsecondary Student Aid Study. Weighted interest rates were estimated by using 2017-18 as the final year of coursework. The rates represent a mix of direct unsubsidized loans and direct PLUS loans from the U.S. Education Department. Annual salaries are based on data from the May 2017 National Occupational Employment and Wage Estimates from the Bureau of Labor Statistics and represent an approximation of what professionals would earn, on average, in the first 25 years of their career. 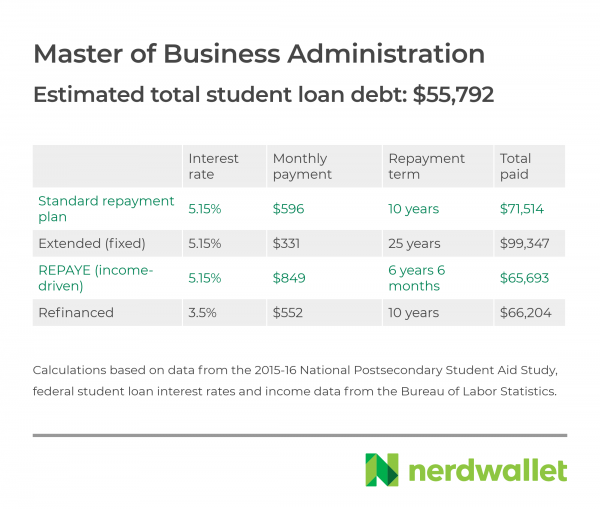 For questions about this analysis, contact Megan Katz at mkatz@nerdwallet.com.